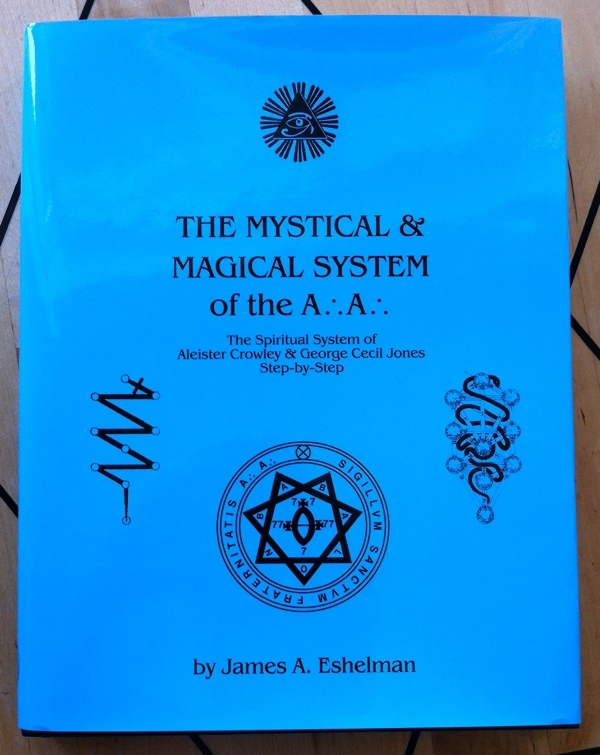 The Mystical and Magical System of the A∴A∴: The Spiritual System of Aleister Crowley & George Cecil Jones Step-by-Step by James A Eshelman, from the College of Thelema, is part of the collection at the Reading Room. “Initiation is a reality. Humanity has a potential to grow far beyond its native state of consciousness and capability. This growth is a spiritual growth. its fruits inform and empower every facet of human, mortal expression, while disclosing to each of us our own inherently immortal natures. On this spiritual growth, more than any other thing, the future welfare and progress of humanity depends. For thousands of years, Adepts have known how to unlock or awaken this growth—how to mature it and unleash genius at will. Beginning in 1906, two such Adepts, Aleister Crowley and George Cecil Jones, organized and made public the mystical and magical disciplines by which any motivated person can achieve this spiritual maturity and have direct experience of realization, liberation, union with God, or cosmic consciousness. They called their system A∴A∴. Its methods are those of empirical science; its aim, those of devoted religion. This book explores, step-by-step, the mystical and magical system of the A∴A∴. For many in the West, it is a strange thought that spirituality can be drilled in the same way that a muscle is strengthened. Yet, an ear trained to listen to music detects wondrous subtleties that the untrained ear misses. The same is true of the palate trained to distinguish fine food and wine, or the eye trained to discriminate nuance in any of a thousand areas. The same is true of spiritual experience. The stages of its unfolding are distinct: the discovery of one’s True Will (or who one is in the Universe), and the practical means of expressing this in the world; the Knowledge and Conversation of the Holy Guardian Angel (or conscious union with the Divine); and the continued advance toward and through that vast gulf, or Abyss, which lies between humanity and Divinity. 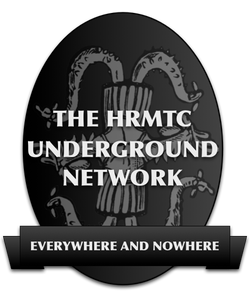 This entry was posted in A∴A∴, Hermetic Library Reading Room, The Libri of Aleister Crowley and tagged A∴A∴, aleister crowley, books, college of thelema, George Cecil Jones, James A Eshelman, Reading Room on July 12, 2014 by John Griogair Bell. 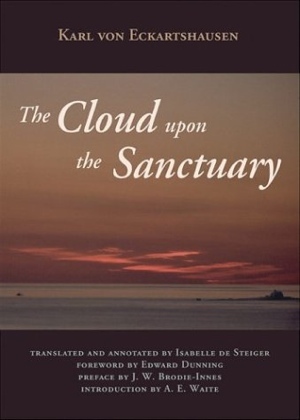 Hermetic Library fellow T Polyphilus reviews The Cloud upon the Sanctuary by Karl von Eckartshausen, introduction by Arthur Edward Waite, preface by J W Brodie-Innes, translated and annotated by Isabelle De Steiger, foreword by Edward Dunning. When Aleister Crowley had just been first turned on to magic by reading Arthur Edward Waite’s Book of Black Magic and Pacts, he wrote to the author to find out what he should study to become an occultist. Waite directed him to Eckartshausen’s Cloud Upon the Sanctuary. A freely-edited version of Letter II from this book later became Crowley’s Liber XXXIII: “An Account of A∴A∴” in which Jesus Christ was replaced with V.V.V.V.V., and God with L.V.X. 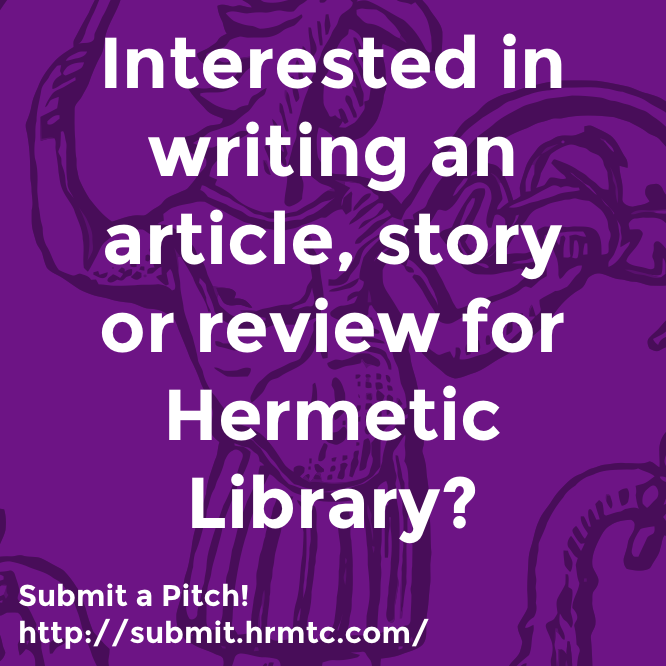 This entry was posted in A∴A∴, Hermetic Library Reading Room, T Polyphilus: Vigorous Food & Divine Madness, The Libri of Aleister Crowley and tagged A∴A∴, aleister crowley, Arthur Edward Waite, books, Isabelle De Steiger, J W Brodie-Innes, Karl von Eckartshausen, Liber XXXIII, lvx, Reading Room, reviews, T Polyphilus, VVVVV on July 4, 2014 by John Griogair Bell. David Shoemaker will be giving a talk, “The System of Aleister Crowley’s A∴A∴ Methods and Tools of Attainment”, followed by a Q&A session and book signing for Living Thelema, at Atlantis Bookshop on July 11th, 2014. 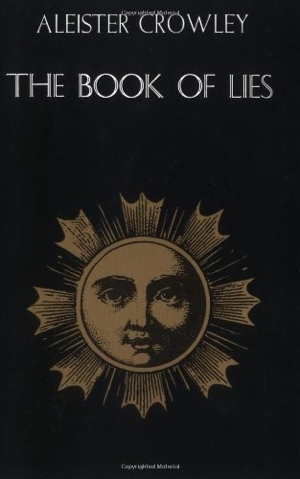 Hermetic Library fellow T Polyphilus reviews The Book of Lies by Aleister Crowley, from Samuel Weiser. It is a short book, made up of many short chapters. Nearly all posthumous editions include the author’s later commentary to the original text, chapter by chapter. While these commentaries often contain useful instruction in their own right, they also frequently serve to misdirect the reader regarding the central message coded into a given chapter. And indeed, it is a highly cryptic book—sometimes whimsical, and often baffling. 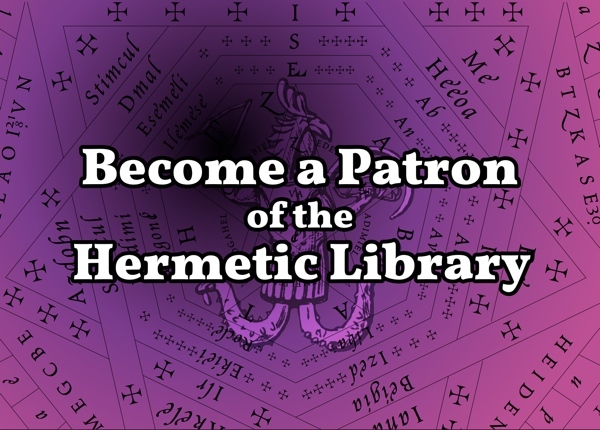 This entry was posted in A∴A∴, Hermetic Library Reading Room, Ordo Templi Orientis, T Polyphilus: Vigorous Food & Divine Madness, The Libri of Aleister Crowley and tagged abyss, aleister crowley, Babe of the Abyss, book of lies, books, Choronzon, Reading Room, reviews, T Polyphilus, theodor reuss on May 27, 2014 by John Griogair Bell. 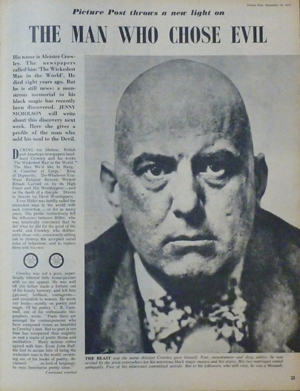 You may be interested in Weiser Antiquarian Books Catalogue #117 Aleister Crowley and Circle. A Miscellany of Used and Rare Books and Ephemera. “The catalogue is divided into three sections, the first of which is devoted to the magnificent Frieda Lady Harris / Aleister Crowley Thoth Tarot Calendar that was published for the year 1987. The calendars are huge (16.5″ x 10.5″) and each has 12 full-colour large size reproductions of different Thoth tarot designs. Serendipitously the alignment of days / dates in 2015 will be exactly the same as it was in 1987, so those who want to actually use the calendar will be able to do so next year! We have only a very small number of original new copies — recently discovered in England — and originals are rare, as many owners disassembled them and framed each of the images individually (we have one such set on the walls at Weiser Antiquarian). The second section is devoted to books and ephemera by Aleister Crowley. It includes a good selection of First Editions of Crowley’s works, including the first separate British and US editions of The Book of the Law (1938 & 1942 respectively), a good selection of First Editions of the first series of The Equinox, including one of the rare white buckram issues of which there were only 50 copies, and a handsomely bound copy of The Equinox, Vol. III, No. 1. (‘The Blue Equinox‘ — 1919) from the library of Ray G. Burlingame (1893–1965) ‘Frater Aquarius,’ a IX degree member of the Agape Lodge of the O.T.O., with his stylised ownership inscription. Other First Editions include a superb set of the first issue of Magick In Theory and Practice (1929) in four parts, with the rare, 4 page prospectus and the single-sheet Subscription Form; The Sword of Song. Called by Christians The Book of the Beast (1904), two different variants of The Tale of Archais. A Romance in Verse (1898), a handsomely rebound copy of Oracles: The Biography of an Art (1905) and first separate editions of The City of God (1943) and The Fun of the Fair (1942), including a copy of the latter with the two additional poems that were left out of most copies because of wartime censorship regulations. Posthumous editions include a highly unusual Thelema publications re-issue of The Vision and The Voice (1952 / 1980), the sought-after John Symonds and Kenneth Grant edited Magical and Philosophical Commentaries on the Book of the Law (1974) and a lovely copy of the Karl Germer edition of Liber Aleph (1962) with the extremely unusual original single-sided prospectus loosely inserted. There is also some fascinating ephemera, including a proof copy of Liber LXXVII. [Liber Oz] with holograph notes by Crowley on the verso; an autograph letter, signed, from Crowley to his physician urgently requesting a replacement prescription for heroin, and a holograph draft of a letter from Crowley to Frieda Lady Harris, along with a typed letter signed to Crowley from his lawyers, who had evidently vetted the contents of the letter on Crowley’s behalf! 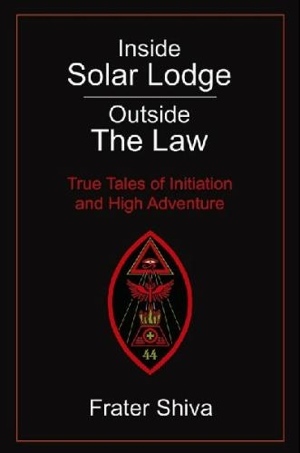 Hermetic Library fellow T Polyphilus reviews Inside Solar Lodge, Outside the Law: True Tales of Initiation and High Adventure by Frater Shiva. There has since 2012 been a new and expanded edition released, available at extortionate prices or a reasonable price. This book is an invaluable addition to the history of Thelema, providing a previously-unavailable level of detail on the principal group in the US that believed itself to be perpetuating a magical catena from Aleister Crowley during the late 1960s. It is quite readable, and mostly credible. Still, practicing 21st-century Thelemites with no particular interest in history may find it somewhat shallow and uninteresting. This entry was posted in A∴A∴, Hermetic Library Reading Room, Ordo Templi Orientis, T Polyphilus: Vigorous Food & Divine Madness, The Libri of Aleister Crowley and tagged 1960s, A∴A∴, books, ceremonial magic, cult, development, Frater Shiva, history, New religious movements, Reading Room, reviews, Solar Lodge, T Polyphilus, thelema on February 23, 2014 by John Griogair Bell. A little while back I posted about the copy of The Commentaries of AL, Volume V No 1 of what is sometimes called the Red Equinox, by Aleister Crowley and another (Marcelo Ramos Motta), the 1975 first edition hardcover from Weiser Books, that is part of the collection at the Reading Room. In that post I mentioned that mine was without the dust cover and asked if anyone with a physical copy of this that still has the dust cover would let me know what the inside flap for this book has to say, if anything, about itself. Clifford B recently sent me scans of the dust cover from his copy of this book so I could take a gander. 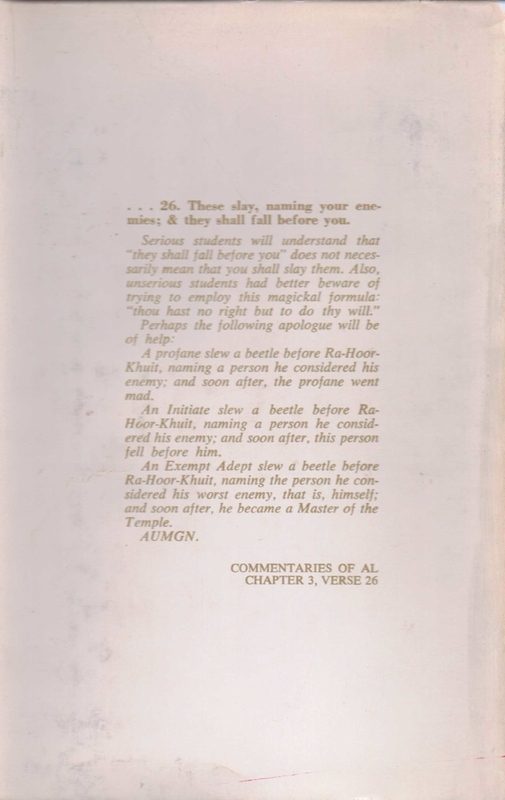 The inside back cover dust copy is an ad for Weiser’s edition of The Equinox, Vol I Nos 1–10, and for The Equinox, Vol 3 No 1, but the inside front dust copy and back cover speak about this volume. 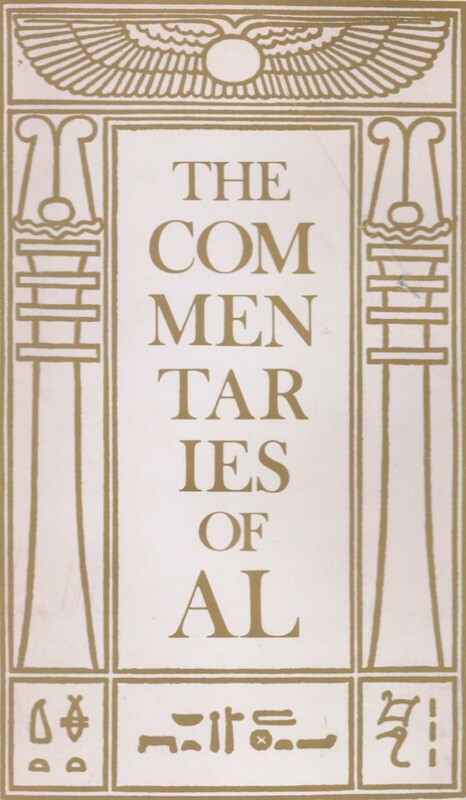 The Commentaries of AL introduces a new series of The Equinox as Volume 5 Number 1, released under the auspices of Marcel Motta, the current Praemonstrator of the A∴A∴ It is the first book to bear the Imprimatur of the Order since the publication of Liber Aleph in 1962. Liber AL vel Legis—The Book of the Law—is an Initiated text whose doctrine is propounded in 220 verses that are to be the guiding principles of makind for the next 2000 years. It was communicated in 1904 through Aleister Crowley, who continually sought to elucidate the mystery of this Book in all his subsequent works. His major effort, the New Comment, was written in the 1920’s. Crowley’s supremely modern point of view in the New Comment has been heightened by Marcelo Motta’s editing, which seeks to eliminate matter of non-magickal value, and other material easily consulted in the published writings of the A∴A∴, now more readily available than in Crowley’s own lifetime. He has himself written an extensive commentary (carefully distinguished by typestyle) that weaves in and through Crowley’s writing with an artistry both provoking and illuminating. “. . . 26. These slay, naming your enemies; & they shall fall before you. A profane lew a beetle before Ra-Hoor-Khuit, naming a person he considered his enemy; and soon after, the profane went mad. An Initiate slew a beetle before Ra-Hoor-Khuit, naming the person he considered his worst enemy, that is, himself; and soon after, he became a Master of the Temple. This entry was posted in A∴A∴, Hermetic Library Reading Room, Liber Legis - The Book of the Law, The Equinox: The Review of Scientific Illuminism, The Libri of Aleister Crowley and tagged 1975, aleister crowley, book 220, Book of the Law, books, comment, commentaries, equinox, liber al vel legis, liber CCXX, marcelo ramos motta, Reading Room, Weiser Books on December 18, 2013 by John Griogair Bell. Magical Record of the Beast 666: The Diaries of Aleister Crowley, 1914–1920, edited with copious annotations by John Symonds and Kenneth Grant, the 1993 third impression of the paperback from Duckworth, is part of the collection at the Reading Room. “Crowley called his Diary a Magical Record because it contains accounts of his magical experiments, including the details of his secret sexual magick and of his consumption of a variety of dangerous drugs. it was not written with an eye to publication. ‘I don’t particularly expect anybody to read it,’ he wrote. Hence the unguarded way in which he recorded his innermost thoughts and performances of secret rites. There is a veiled reference to this extraordinary journal in his Magick in Theory and Practice, 1929. ‘Yea, he [Crowley’s Holy Guardian Angel, Aiwaz] wrought also in me a Work of Wonder beyond all this, but in this matter I am sworn to hold my peace.’ The ‘Work of Wonder’ was his supreme initiation into the highest grade of the mystical Order of the Silver Star, the beginning of which is described in this volume. Crowley, who died in 1947, had to hold his peace about that, and certainly about his sexual magick. Today, in these confused times, strange creeds thrust themselves forward, asking to be examined. everything is in the melting pot and a way out of the chaos in being anxiously sought. There is no stranger creed than Crowley’s doctrine of Do What Thou Wilt. Nor are there any experiences more exotic than his mystical illuminations and initiations. This entry was posted in A∴A∴, Hermetic Library Reading Room, Ordo Templi Orientis, The Libri of Aleister Crowley, Thelema and tagged 1993, aa, Aiwaz, aleister crowley, books, creeds, dangerous drugs, Do what thou wilt, Duckworth, holy guardian angel, illuminations, initiation, innermost thoughts, john symonds, Kenneth Grant, Magick in Theory and Practice, melting pot, ordo templi orientis, Reading Room, secret rites, sexual magick on September 20, 2013 by John Griogair Bell. 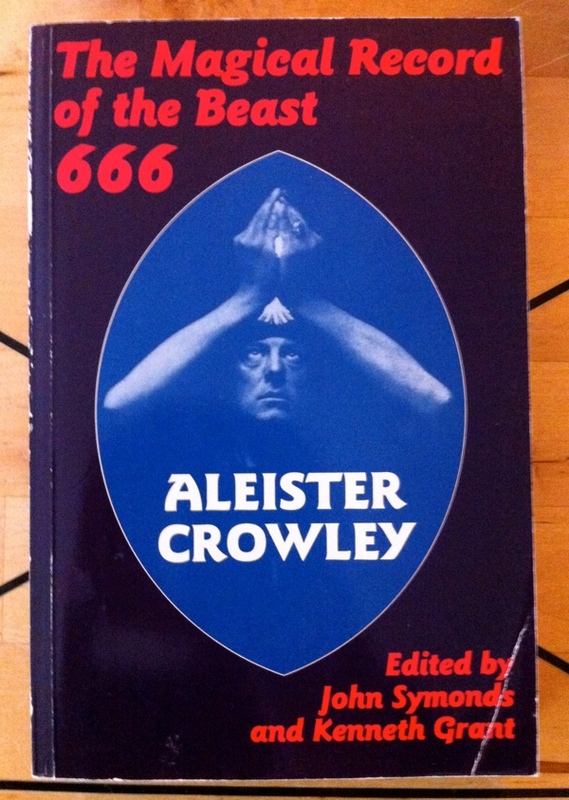 You may be interested in Weiser Antiquarian Book Catalogue #110: Aleister Crowley: New, Used and Rare Books and Ephemera. Including a Selection of Books from the Library of Wilfred T. Smith. “Welcome to the one hundred-and-tenth of our on-line catalogues, this being another of our specialised Aleister Crowley lists. The catalogue begins with three interesting new releases: signed copies of Marlene Cornelius’ Liber AL Vel Legis: The Book of the Law. 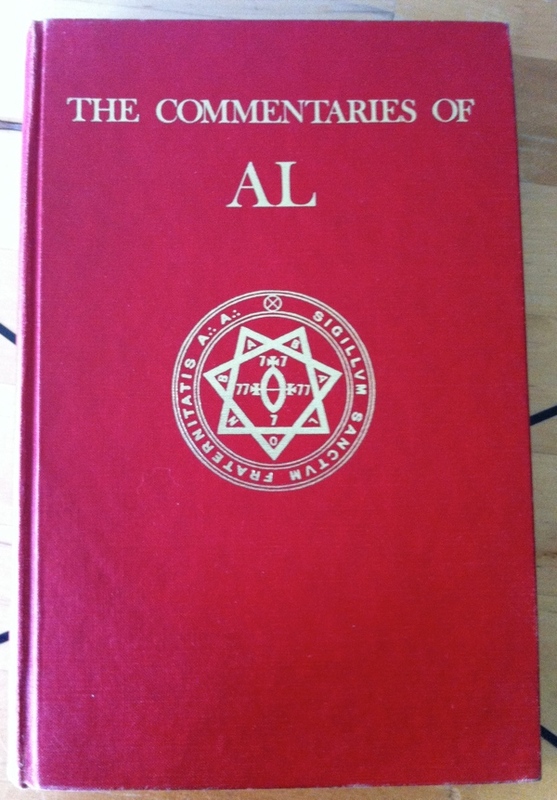 An Examination of Liber XXXI & Liber CCXX; and David Shoemaker’s Living Thelema: A Practical Guide to Attainment in Aleister Crowley’s System of Magick, and the always-interesting and beautifully produced AMeTh Lodge Journal. Vol. I, No. II from AMeTh Lodge of the O.T.O. in London. The next item is “Dark Halo,” a signed and numbered Limited Edition Print of a portrait of Aleister Crowley by California artist Heather McMillen, with an accompanying hand-written poetic “homage to Aleister Crowley” by Blair MacKenzie Blake, author of The Wickedest Books in the World and other works. The third section of the catalogue is devoted to books and ephemera by Aleister Crowley himself. Amongst the rarities included are a copy of the Cambridge University magazine Granta which includes an anonymous poem by Crowley, a copy of the vellum bound first volume of The [Collected] Works of Aleister Crowley with an extraordinary double inscription, and Nicholas Bishop-Culpeper’s personal copy of Magick In Theory and Practice, beautifully bound in full vellum. There is also a group of four autograph letters, signed by Crowley; each is significant in its own way, with topics ranging from Crowley’s alleged share holdings in Australia, to a defense of Aubrey Beardsley! A selection of copies of The English Review, each with a contribution by Crowley, are followed by a varied group of books and journals that in one way or another relate to “the Beast.” Included amongst the journals are a copy of Esquire Magazine from March 1970 with a detailed and heavily illustrated series of essays on Californian occultism, that also reproduces a newsclipping concerning the famous “Solar Lodge” “Boy in the Box” debacle; a complete set of Sothis Magazine from the 1970s, a collection of the first seven issues of the Typhonian magazine Starfire; and 3 consecutive issues of Picture Post Magazine from 1955 which serialised a well-illustrated but breathless account of Crowley’s life. Amongst the books in the same section are a first edition of The Macedonians by Mary Butts, the English novelist and serious occult practitioner who spent some time at Cefalu with Crowley, the very uncommon first edition of Tiger-Woman by Betty May, in which she recounts her own time at Cefalu, and Nina Hamnett’s Laughing Torso, a book which eventually led Crowley into bankruptcy after he sued it’s publishers for libel, and failed. Proudly powered by WordPress Theme: Twenty Twelve THL.